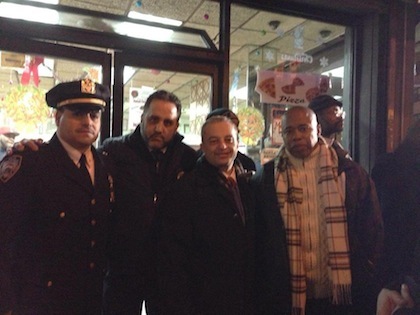 Turkish American Community Leaders Erhan Yildirim and Ibrahim Kurtulus was invited by Brooklyn Borough President Eric Adams who was holding a vigil for the 2 Selin NYPD officers. The United American Muslim Association Fatih Mosque a Turkish American group based in Brooklyn made a statement at the program on Sunday night. Their Statement is as follows: "We condemn this senseless shooting of the two New York City police officers Wenjian Liu and Rafael Ramos, in the strongest possible terms. This was an unspeakable act of barbarism; Our entire community was deeply saddened to hear of the loss of these two brave officers in the line of duty. On behalf of the United American Muslim Association which represents 33 other Mosque in the US and head quartered here in Brooklyn , We want to express my most sincere heartfelt condolences to the officers the families, & entire NYPD community, of the two police officers killed in Brooklyn while seeking to protect our city. This cowardly attack again reminds us all the dangers that are routinely faced by those who protect and serve their fellow citizens. As a nation we must not forget this as we discuss the events of the recent past. These courageous men and women routinely incur tremendous personal risks, and place their lives on the line each and every day, in order to preserve public safety. We are forever in their debt. Our people, our community, our great City must always honor the valor -- and the sacrifices -- of all law enforcement officers with a steadfast commitment to keeping them safe and also including our Turkish American offices in being safe in there serves.This means forging closer bonds between officers and the communities they serve, so that public safety is not a cause that is served by a courageous few, but a promise that's fulfilled by police officials and citizens working side by side. The United American Muslim Association, Fatih Mosque and the Turkish American community will continue to support good leadership between all communities for a better and greater dialogue, understanding and appreciation between all." Former NYPD Officer and current Borough President Eric Adams thanked to Turkish American Community for their support on this matter.